Puller Pro Brushless 4 pole Rock Crawler motors- Lay down the Power! Thread: Puller Pro Brushless 4 pole Rock Crawler motors- Lay down the Power! Re: Puller Pro Brushless 4 pole Rock Crawler motors- Lay down the Power! Building a Bomber and had a 1080 with a 21T Holmes Trailmaster brushed motor in it and thought it was a lot of fun. Tonight I installed the Mamba X with Puller Pro 3500Kv, 3s Lipo, and stock kit gearing. I adjusted the throttle and brake curve. From a dead stop I’m literally lifting the truck off the ground with a stab of the throttle. The power is ridiculous! I also dig the aux feature of the esc. Drag brake when needed and then I can switch and coast more for higher speed stuff. Only thing I’m not digging is even with 100% drag brake in crawling mode I find the Bomber to roll and not hold position well. Will overall brake strength on mamba x affect the drag break amount? Last edited by jamesbernatchez; 01-04-2019 at 09:50 PM. On the official website (holmeshobbies.com) the motors have fallen in price by $45, this sale or the specified price will be constant. I mean, hurry hurry the motors won’t last long! Hello John, I'm building up my new Axial 1.9 Wraith (running on 3S) and I want to try out one of your systems for a change up from things I've used in the past. With my Scaled heavy SCX10 II I've enjoyed very slow scale crawling but with this 1.9 Wraith I want to use it for more of a comp rig to X4, at least that's my intent. I'm thinking of running the Trailmaster BLE Pro ESC and maybe getting that Puller Pro 540 Stubby 2700kV, would this be a good fit for that lighter rig? I will probably toss in heavier Vanquish portal axles for it but I'm keeping this rig lighter and less scaled as I would like to be able to run this rig faster when called upon to go from gate to gate. Is the stuby 2700kV enough kV or should I be looking at 3300kV and or should I select normal sized Puller Pro 540 can in 2700kV over the Stuby can? I would still like to have smooth crawling ability too. Thank you and I'd appreciate your wisdom if you have time to comment. Last edited by Howlkat; 04-02-2019 at 05:39 PM. I would choose the stubby can for that build. It's plenty of power. 2700 is a great choice, 3300 could work fine too. 2700 would be more suited to competing though, just typically a bit easier to control and won't get you in trouble with too much power on tap. Thank you for your insight and speedy response John! Put in on order for the Puller Pro 540 Stubby 2700kV w/ TrailMaster BLE Pro ESC. Going to try out your SHV500V2 servo too, I used a Protek 370 TBL with my heavy SCX10 ii build, time to give yours a try with this Axial 1.9 Wraith now! You will not be disappointed one bit. They are "peppy" with gobs of power. 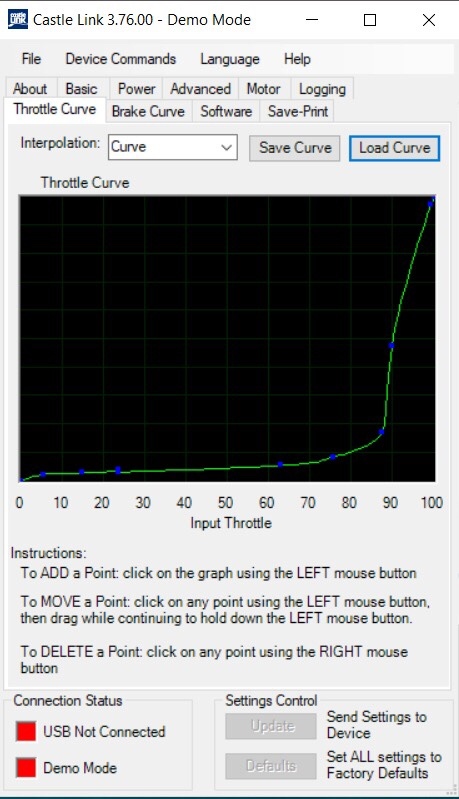 My favorite way to get optimal control is run a linear throttle curve and use your radios EXPO to get a good low speed control. Several of my combos are set between 30-50% and the start up is super smooth and no jerking/jumping when bound up and rolling in throttle lightly. Just something to look at if you feel things are starting too strong. Its convenient running it off the radio to tune rather than the esc programming.